But due to new legislation that has recently been passed by the federal government, our borrowers now have limited time to receive these substantial savings! Known as the College Cost Reduction and Access Act of 2007, this new legislation will cut about $21 billion from the Federal Family Education Loan (FFEL) Program, which Medical School Loans is a part of. This budget cut may lead to the elimination of Medical School Loans' borrower benefits after October 1. Currently, Medical School Loans offers borrower benefits that can lower its borrowers' interest rates by as much as 1.25%. However, after the October 1 deadline, this may no longer be the case. Therefore, borrowers are advised to act fast and begin their federal student loan consolidations with Medical School Loans now! To save you as much as possible, Medical School Loans guarantees that once its borrower benefits have been earned, they cannot be lost or revoked, regardless of the situation! They are guaranteed by Medical School Loans for the life of the consolidation! None of our competitors can make this claim! However, after October 1, these great benefits may no longer be available. Because of the approaching deadline, borrowers who want to potentially save thousands of dollars over the lives of their federal student loans need to act now! Beginning a federal consolidation application with Medical School Loans today will give borrowers the best chance to receive the money-saving benefits they deserve! As one of the leading consolidation companies in the industry, Medical School Loans helps medical students and physicians manage their multiple student loans. By choosing to save money and consolidate with Medical School Loans, borrowers can rest assured that their loans will be handled by professionals. And because we only provide our elite services to medical students and physicians, we can focus on providing our borrowers with the highest-quality service possible. As experts on both federal and private student loans, we understand the processes for consolidating all types of loans. Call Medical School Loans Today! After October 1, it will be too late to receive the great benefits that Medical School Loans can provide! Call 800-680-7197 or visit www.medicalschoolloans.com today! 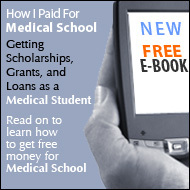 Article Title : The Time to Consolidate Federal Medical School Loans is Limited!